Across New York City, more than 70 restaurants are tossing their oyster shells not into the trash or composting pile, but into the city’s eroded harbor. It’s all part of Billion Oyster Project’s restaurant shell-collection program. The journey from trash to treasure begins after an oyster half shell is turned upside down and left on an icy tray. Once discarded, it joins hundreds of thousands of other half shells collected in blue bins and picked up (free of charge) from restaurants five days a week by Billion Oyster Project’s partner, The Lobster Place, a seafood supplier. 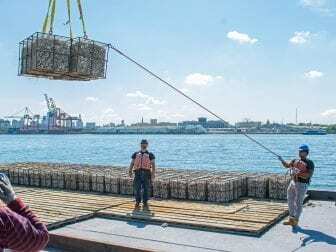 The shells are trucked over to Brooklyn’s Greenpoint neighborhood and once a month are brought en masse to Governors Island in the heart of the New York Harbor, just yards away from both Brooklyn and Lower Manhattan. There, rolling shell hills sparkle in the sun while “curing” out in the elements for one year, a process that rids them of contaminants. The shells then get a final cleaning and are moved to Billion Oyster Project’s hatchery at the Urban Assembly New York Harbor School, a public high school on Governors Island that offers technical and vocational training in the marine sciences. In an aquaculture classroom’s hatchery, student-grown oysters produce larvae in an artificially induced springtime environment. In one to two weeks, each larvae grows a “foot” — a little limb covered in a kind of natural glue — and then is moved to a tank full of the “cured” restaurant shells, which serve as anchors for all of those sticky feet. This phase is critical: If larvae can’t find a place to attach, they die. One reclaimed shell can house 10 to 20 new live oysters, depending on shell size. Billion Oyster Project Executive Director Pete Malinowski says none of this work would be possible without the restaurant shell-collection program. “It’s critical. We need oyster shells to do our work, and the only place to get them is from restaurants,” Malinowski says. Luckily, restaurants are more than happy to oblige; Billion Oyster Project has collected more than 1 million pounds of oyster shells, well on the way to its goal of creating 1 billion live oysters — hence its name — across 100 acres of reefs by 2035. Owens says the project is not just smart for sustainability; it’s also good for business. Recycling shells significantly reduces carting expenses, something all NYC restaurants must pay for by the bag. “Recycling them into the reef is a huge savings,” he says. Rosenthal hopes to be able to get the bill passed within a year. “It conforms with the state’s interest in shoreline protection and shellfish reintroduction, it helps the local restaurant community and involves kids, so I am optimistic,” she says. The idea came from neither restaurants nor Rosenthal, but from students at one of Billion Oyster Project’s partner schools, West End Secondary on the Upper West Side. Rosenthal championed their idea, building support for the bill and bringing the students to Albany to learn about lawmaking and to participate in a press conference. Education of the next generation of environmental stewards has been at the heart of Billion Oyster Project since its inception in 2008, when Malinowski was teaching aquaculture at the Harbor School. With the support of the school’s founder, Murray Fisher, Malinowski devised a project to enable students to apply their learned skills to a problem in their own back yard — the degradation of the New York Harbor. In 2010, when the school moved from Brooklyn to Governors Island, Malinowski grew his curriculum into a formal three-year vocational program in which students grow oysters; design, build and monitor reefs; and operate boats and perform marine biology research. “It became a way for all of our students to work together,” he says. The health of the harbor also has improved. “We can measure an improvement in water quality and see an immediate impact on biodiversity everywhere we put a reef down,” Malinowski says.